In medical chart reviews of 2,430 kidneys transplanted from 1,298 donors–585 (24 percent) of them with AKI–researchers say they found no significant differences in rates of organ rejection among kidneys from deceased donors with or without AKI. 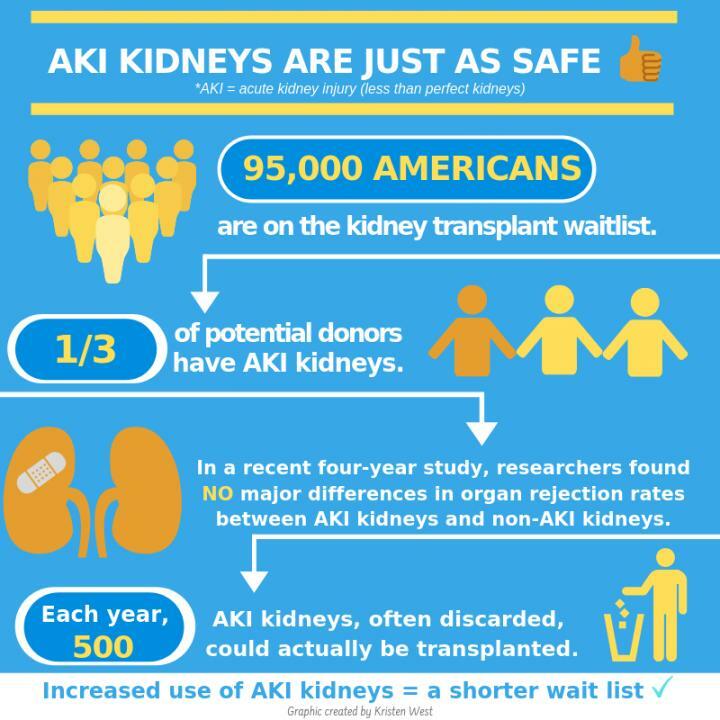 They also report they found no evidence that factors such as the amount of time an organ is chilled and left without blood supply before transplantation had any impact on recipient outcomes for those who received AKI kidneys. Results of the study, published Nov. 20 in the journal Kidney International, suggest that patients in need of kidney transplant could have access to more kidneys–potentially shortening organ waiting list times, the investigators say. “Our results should add to evidence and reassure the general public and the transplant community that acutely injured deceased-donor kidneys appear to have the same success rates as noninjured kidneys from otherwise similar donors,” says Chirag R. Parikh, M.B.B.S., Ph.D., director of the Division of Nephrology at the Johns Hopkins University School of Medicine and senior study author. “Even transplanted kidneys with the highest severity of AKI did not have worse outcomes, so we should bring these kidneys into the donor pool with confidence,” Parikh adds. Nationwide, the discard or rejection rate for all potential donor kidneys is approximately 18 percent, and for AKI kidneys about 30 percent, Parikh says. “We estimate there may be approximately 500 kidneys a year with AKI that are currently discarded, but can be transplanted.” Some criteria that surgeons use around decisions for kidney discard include the presence of diabetes, hypertension or poor kidney donor profile index–a standard measure of how likely a kidney is to function over time. The current study had two parts. In the first section, researchers conducted transplant chart reviews for kidneys from 1,298 donors in five regional organ procurement organizations (Philadelphia, Michigan, New York, New Jersey and New England) from 2010-2013, and linked them to 2,430 single kidney transplant recipients via the Organ Procurement and Transplantation Network’s national transplant registry. Donors with AKI, compared with donors without AKI, were more often African-American (24 percent versus 13 percent), more likely to have hypertension (36 percent versus 29 percent), and had a higher average kidney donor profile index (56 versus 46). Recipients of AKI kidneys versus non-AKI kidneys were more often older (55 versus 52 years old), and donor AKI kidney transplants had longer mean cold ischemia time (16.4 hours versus 14.9 hours)–the amount of time an organ is chilled before transplantation. The AKI kidneys also were more likely to undergo machine perfusion (a technique to push fluids through the organ to preserve it), a difference of 46 percent versus 37 percent, and slightly more likely to have human leukocyte antigen mismatches–a measure of how compatible a donor and recipient will be based on cell proteins. Yaqi Jia, M.P.H., of Johns Hopkins was a contributing author of the study. Other authors hailed from the University of Utah School of Medicine, Albert Einstein College of Medicine, the University of Maryland School of Medicine, the University of Michigan Medical School, Drexel University Dornsife School of Public Health, Drexel University College of Medicine, Yale University School of Medicine, the Columbia University Renal Epidemiology Group, Columbia University Mailman School of Public Health, Columbia University College of Physicians & Surgeons, New York Presbyterian Hospital-Weill Cornell Medical Center, the University of Pennsylvania Perelman School of Medicine, the University of Pennsylvania’s Center for Health Incentives and Behavioral Economics, Thomas Jefferson University Hospital, Barnabas Health in Livingston, New Jersey, and University Hospital in Ulm, Germany. This work was supported by the National Institute of Diabetes and Digestive and Kidney Diseases (NIDDK) grants R01DK-93770 and K24DK090203; the Health Resources and Services Administration contract 234-2005-37011C; a Roche Organ Transplantation Research Foundation Award to Parikh; and a Fellow-to-Faculty award from the American Heart Association, and an NIDDK career development grant (K23DK105207) to other co-authors.